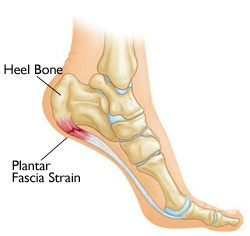 Plantar fasciitis is the most common injury occurring at the hind foot. An irritation and swelling of the fascia on the plantar aspect of the foot. Pain generally located at the posterior and medial aspect of heel. With excessive pronation the plantar fascia is overstretched as the medial longitudinal arch collapses. In a rigid foot, the calf muscles might be tight, limiting the dorsiflexion and putting more strain on the fascia as the foot moves into toe off.